Sorg Nissan Introduces the All-New 2017 Nissan Maxima! Sorg Nissan is thrilled to introduce you to the new 2017 Nissan Maxima, which offers up stellar engine performance, gorgeous exterior design, a wide spectrum of entertainment, information, and connectivity technologies, and solid safety systems to keep you protected on the road. Read on for all the details on the new Nissan Maxima! First of all, the Maxima is distinguished by its power, performance, and gorgeous exterior design. On the one hand, the Maxima gives you (1) a titanically powerful engine and solid efficiency rates, but it also provides (2) Xtronic Transmission; (3) a Drive Mode Selector; (4) beautiful, well-designed wheels; (5) a wide selection of lighting devices; and (6) the Maxima’s signature “floating” roof design. Check out all the details by reading on. Where better to start than with the Maxima’s phenomenal drivetrain. Not only does this beast of a vehicle run on a legendarily powerful 3.5L DOHC 24-valve engine that gets 300 hp, but this engine also features a new design completed especially for the Maxima. In fact, in addition to boasting sodium-filled exhaust valves as well as anodized pistons, this 3.5L powerhouse also sports a new high-flow tuned induction system for even higher-quality performance. 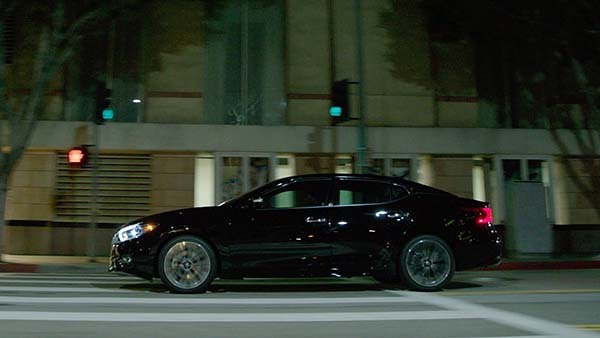 Like its other Nissan brethren, the Maxima provides drivers with an exceedingly well-constructed transmission system: an Xtronic Continuously Variable Transmission system that offers you dynamic step shifting, wider gear ratio coverage, and an adaptive shift controller, too. What this means is that you’re going to get a drive that is at once more economical and more powerful, giving you unique shift points, better fuel economy, and a little extra oomph when you hit the highway. With the Maxima’s new Drive Mode Selector, you’ll be able to choose one of two impressive driving modes. On the one hand, you can opt for a Manual Mode when you want to exert as much control as possible over your ride. On the other hand, you can also go for this car’s new Sport Mode, which enables you to increase your throttle’s response, heighten its steering feel, and strengthen its transmission tuning all at the same time. At the same time, Drive Mode Selector can also adjust the car’s Active Sound Enhancement to bring the engine’s roar into the cabin for an unforgettably visceral driving experience. 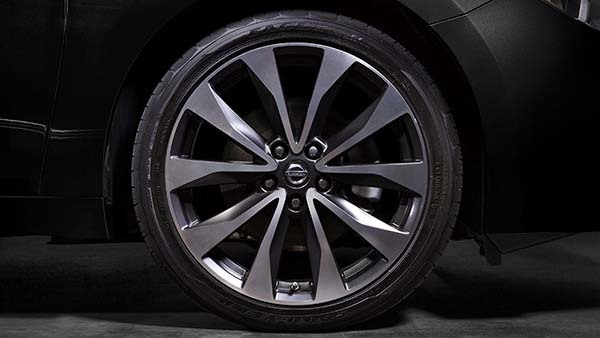 Not only does the Maxima give you a set of absolutely stunning wheel rims—for example, you’ll get 18-inch aluminum alloy wheels that boast machine-finishing for extra allure—but you can also count on P245/45VR18 tires that promise to match the wheel’s astonishingly beautiful rims with second-to-none functionality at the same time. You’ll be able to count on turning heads throughout town while also resting assured that you’re driving one dependable vehicle. 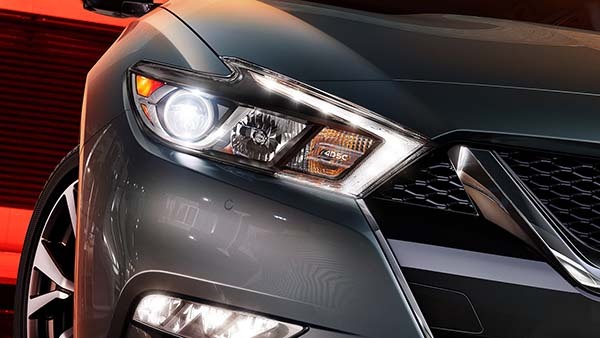 Just as exciting as the Maxima’s new wheels is its newly redesigned lighting system. First of all, you’ll get Nissan’s signature boomerang-shaped headlights, which sport a constantly illuminated LED band, while in the rear you can count on wraparound taillights with an embossed 4DSC logo. 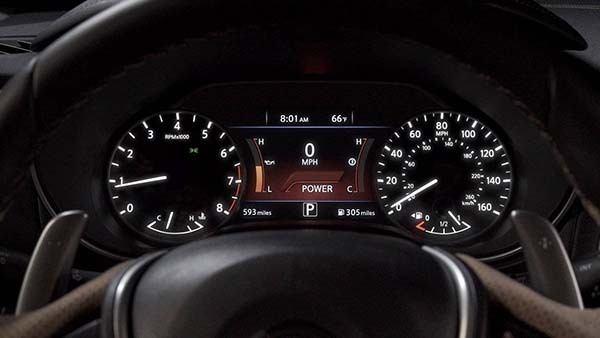 Second, though, you can also count on LED turn signal indicators on the Maxima’s power-heated outside mirrors, which will guarantee you a little extra visibility on those dark, foggy Lake-side nights. Inspired by the canopy of a fighter jet, the Maxima’s “floating” roof design is a stunning touch, giving the car the appearance of an aircraft with its hovering roofline. By ensuring that the A, B, and C pillars blend into the car’s glasswork, designers have constructed a roof that is sleek, fashionable, and functional, all at the same time. 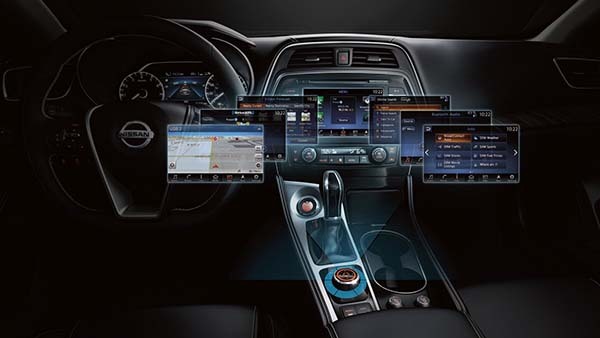 Yet the Nissan Maxima also gives you a spectrum of some of the most advanced technologies to keep you entertained, even while it also boasts a number of sophisticated design perks as well, including (1) Bose Premium Audio; (2) a NissanConnect device; (3) two illuminated USB ports; (4) a Driver Assist Display Screen; (5) a Panoramic Moonroof; and (6) luxurious seating options. Check out the details by reading on. Like Nissan’s other new vehicles, the Maxima gives you a maximally impressive audio system: an 11-speaker Bose Premium Audio system to keep the music pumping throughout the drive. Yet in addition to its conveniently placed speakers, this system also boasts Centerpoint 2 Surround Technology to allow you to experience surround sound no matter what source—MP3, satellite radio, or CD player—you choose to utilize. At the same time, it’s all about that bass with the Bose, which provides you with simply unbeatable subwoofer for superb sound quality and power. 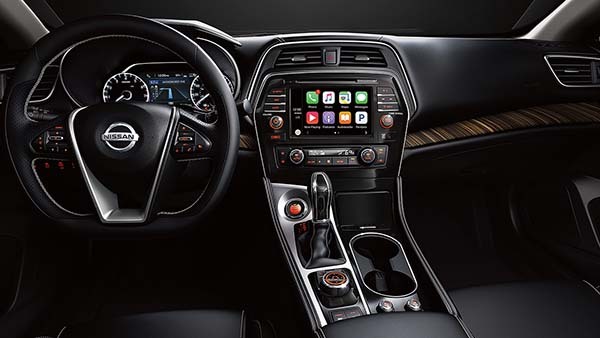 With NissanConnect, your Maxima allows you to plug your smartphone directly into its console, thereby enabling you to access all of your own music, your own apps, your own podcasts, and just about anything else you care to. In fact, using NissanConnect, you can even place calls and send texts to your friends and families using the Maxima’s touchscreen, or you can do it via Voice Recognition, simply by speaking to your vehicle. 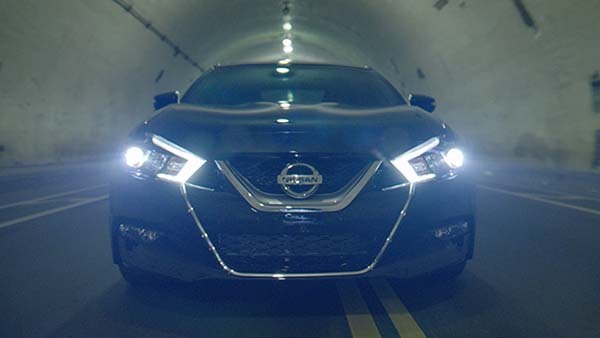 With Nissan Connect, the Maxima truly welcomes you to the automotive space-age. However, with so many musical options courtesy of NissanConnect, you’re going to want to make sure that your smartphone never runs out of charge. Luckily, the Maxima also gives you USB ports that make it possible for you to plug your phone directly into the car in order to keep it all charged up. Thus, you’ll never have to worry about running out of battery power on those long drives. 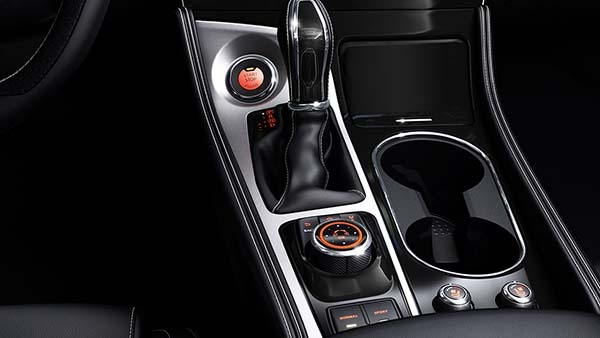 Meanwhile, the USB ports are also illuminated to ensure that you have no trouble finding them on night drives, allowing you to avoid fumbling around unsafely. 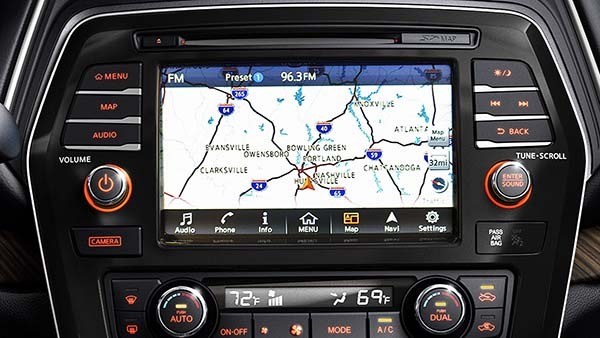 Not only this, but the Maxima also provides drivers with a gorgeous, functional 7.0-inch color advanced Drive-Assist display screen that exhibits all your car’s absolutely vital information right in front of you for your analysis. Not only can you rely on it for turn-by-turn directions and caller ID, but you can also use it to ensure the proper functioning of your Maxima’s safety features as well as more mundane stats on gas, efficiency, and more. 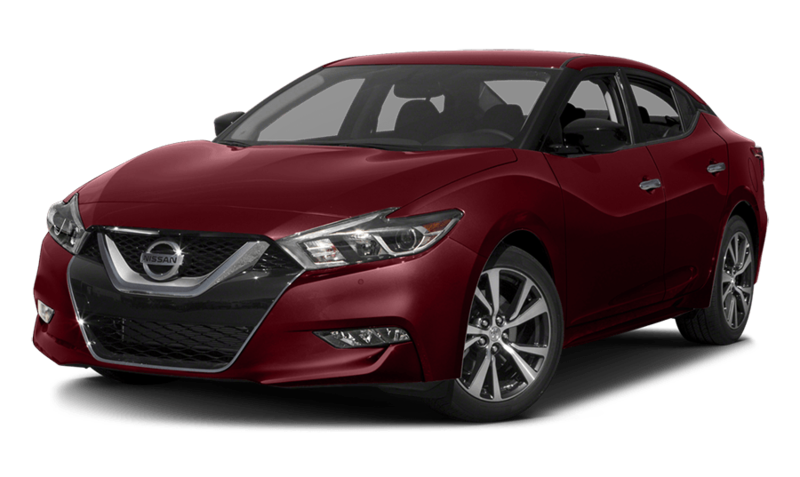 But in addition to these exciting technological offerings, the Maxima also offers drivers two especially thrilling add-ons to make your driving experience truly memorable. 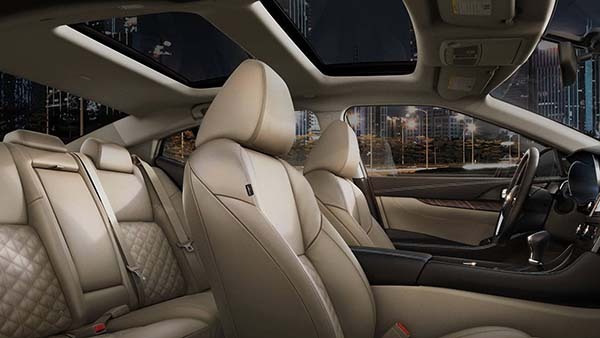 First of all, this car features a built-in panoramic moonroof that is so large that it covers both the front and back seats, allowing you and your passengers to sit back and bask in the warm glow of that famous late-September light during your next weekend outing. 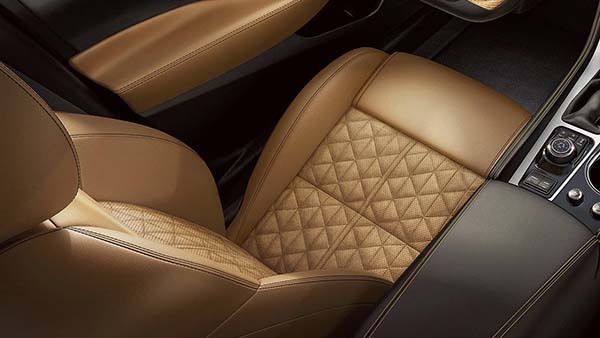 Likewise, the Maxima also gives you some of the most luxurious seating available on the market. 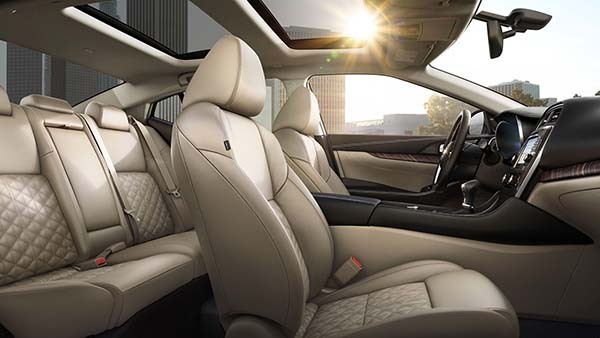 You can opt for double-stitched and deeply bolstered leather seating to cover the Maxima’s five seats, but you can also look forward to heated front seats, driver’s seat power lumbar support, and a driver’s seat manual thigh support extension that allows you to rest your thigh during longer drives for added comfort. Last but not least, the Maxima is also outfitted with a wide range of safety systems designed to keep you and your passengers as safe as possible. These include—but are not limited to—(1) Blind Spot Warning; (2) a Rear Cross Traffic Alert device; (3) Predictive Forward Collision Warning; (4) Front and Rear Sonar Systems; (5) Vehicle Dynamic Control wth Traction Control; and (6) an Advanced Air Bag System. 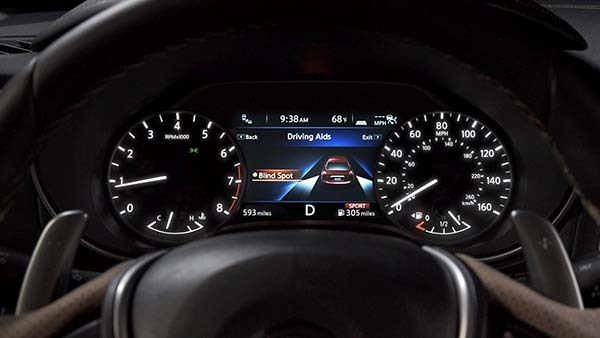 The Maxima’s Blind Spot Warning system can survey the area around your car and detect when other vehicles have entered your blind spot. When it does so, it will alert you to their presence in order to allow you to make quick, effective choices on the highway to avoid any threats. 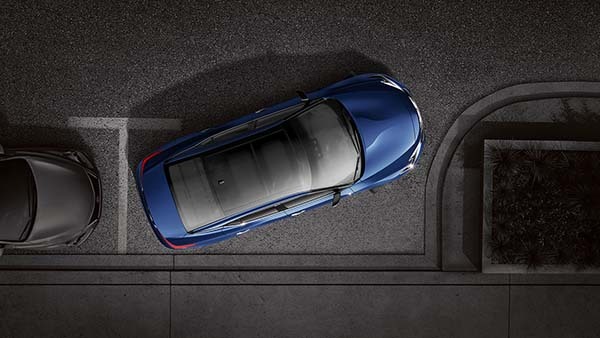 One of the most exciting things about the Maxima is that it provides a powerful Rear Cross Traffic Alert system that makes backing up easier than ever. Next time you’re up in Chicago and trying to back out of a tight spot and into traffic, you can rely on Rear Cross Traffic Alert to let you know when another car is approaching so that you can maneuver safely and effectively. Predictive Forward Collision Warning is one of those truly one-of-a-kind devices that is a game changer when it comes to safety. 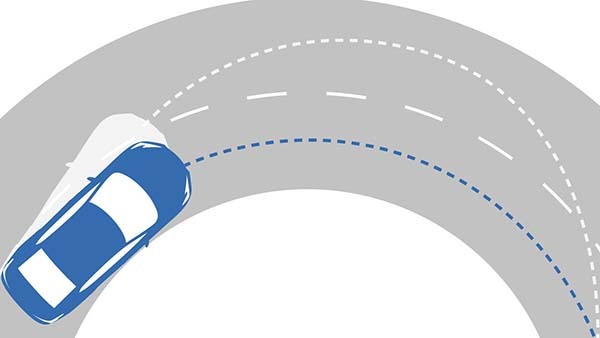 Utilizing a sensor placed at the front of the vehicle to survey the area in front of the Maxima for other cars, Predictive Collision can determine when another vehicle has suddenly decelerated and warn you of your approach. 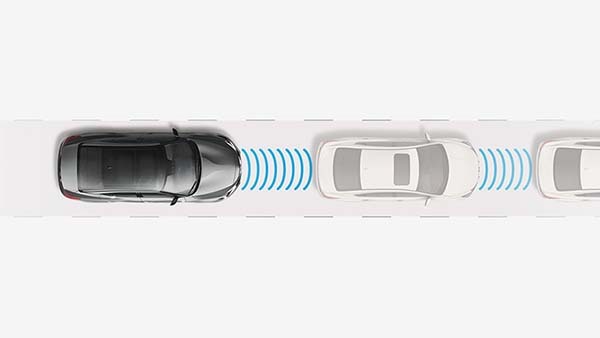 Front and Rear Sonar employs eight sensors that are stationed on the front and the back of the car to sense the presence of cars or other impediments objects as you are moving forward or backing-up. When it observes something in the way, it will alert you, enabling you to respond accordingly, thus making parallel parking, for example, a piece of cake. Indiana drivers know how treacherous an Indiana winter can be. And with winter fast approaching, you’re going to want a car that you can trust will keep you safe when you’re barreling down the highway at epic speeds. 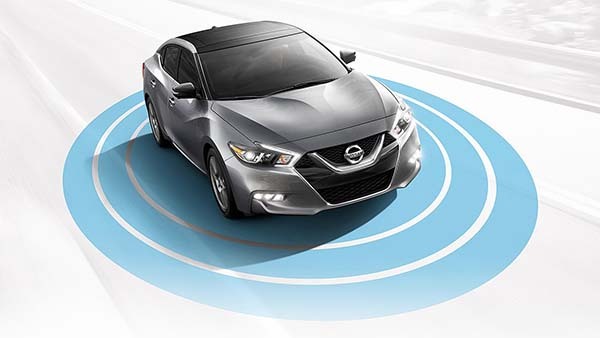 With Vehicle Dynamic Control, the Maxima assesses wheel-spin rates and your turning angle to determine when your car is in danger of losing its stability and then rectify the situation for you. Meanwhile, its Traction Control device works in a similar way to optimize your traction in dangerous weather conditions. But of course sometimes safety devices are not enough, and you need to rely on a vehicle’s airbags to prevent serious injury. Luckily, the Maxima has them in spades: from dual-stage supplemental front air bags with seat-belts and occupant-classification sensors, to its driver and front-passenger seat-mounted side-impact supplemental airbags, roof-mounted curtain side-impact supplemental airbags, and additional front- and rear-seat outboard occupant head protection, your Maxima will keep you as secure as possible in the event of a collision.